Mike Schwartz Construction is featured in a case study by LP SmartSide! Case study by LP SmartSide! LP is a global leader in delivering high-performance building solutions. 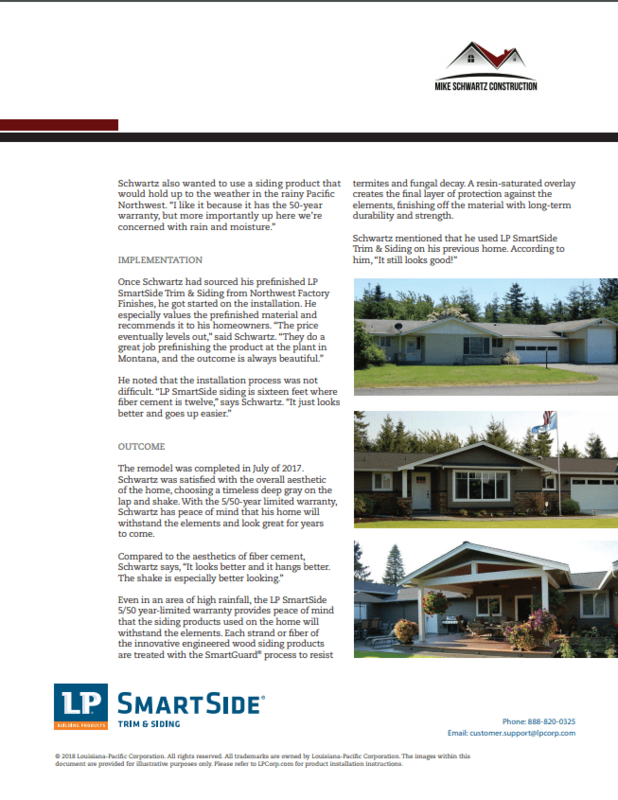 They featured Mike Schwartz Construction in a case study for their LP SmartSide siding! We are very proud of the recognition we have received. Thanks to LP for highlighting our work! Mike Schwartz, owner of Mike Schwartz Construction, used LP® SmartSide® Trim & Siding on his own home, where he personally installed the product on a single-story 3,500 sq. ft. remodel. 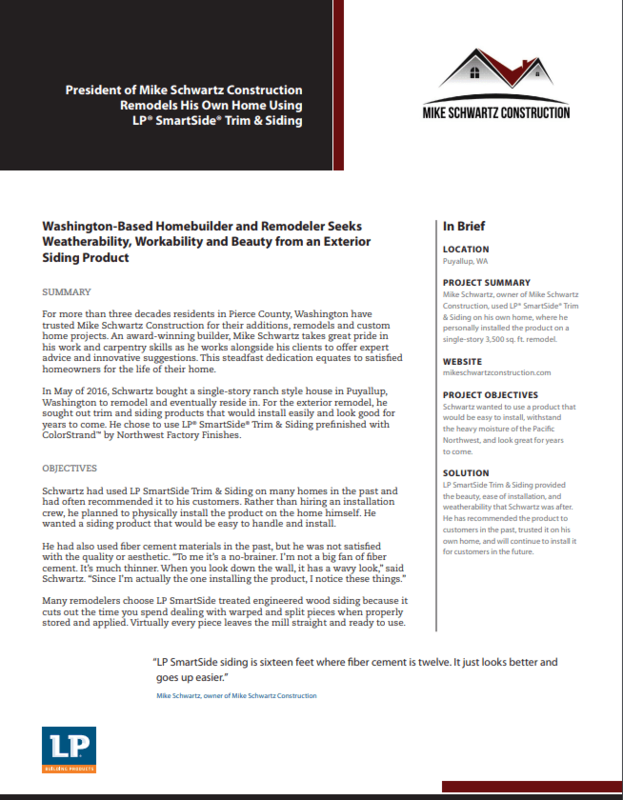 For more than three decades residents in Pierce County, Washington have trusted Mike Schwartz Construction for their additions, remodels and custom home projects.  An award-winning builder, Mike Schwartz takes great pride in his work and carpentry skills as he works alongside his clients to offer expert advice and innovative suggestions. This steadfast dedication equates to satisfied homeowners for the life of their home. 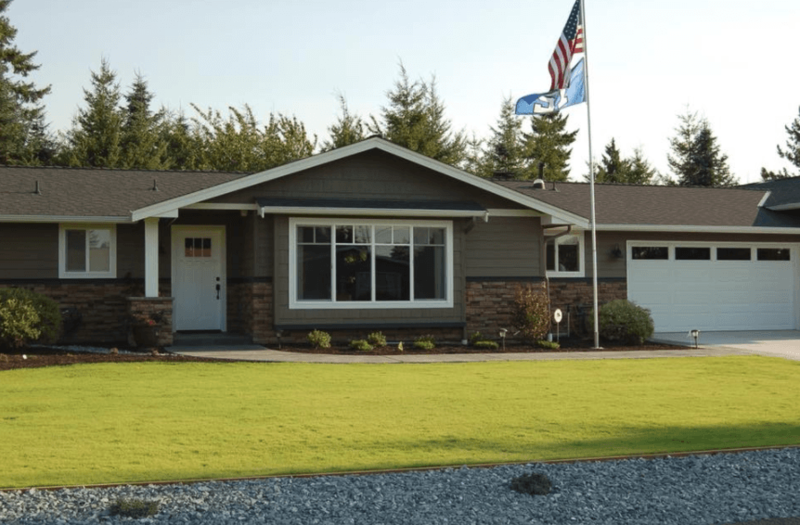 In May of 2016, Schwartz bought a single-story ranch style house in Puyallup, Washington to remodel and eventually reside in. For the exterior remodel, he sought out trim and siding products that would install easily and look good for years to come. He chose to use LP® SmartSide® Trim & Siding prefinished with ColorStrand™ by Northwest Factory Finishes. Schwartz had used LP SmartSide Trim & Siding on many homes in the past and had often recommended it to his customers. Rather than hiring an installation crew, he planned to physically install the product on the home himself. He wanted a siding product that would be easy to handle and install. Many remodelers choose LP SmartSide treated engineered wood siding because it cuts out the time you spend dealing with warped and split pieces when properly stored and applied. Virtually every piece leaves the mill straight and ready to use. The remodel was completed in July of 2017. Schwartz was satisfied with the overall aesthetic of the home, choosing a timeless deep gray on the lap and shake. With the 5/50-year limited warranty, Schwartz has peace of mind that his home will withstand the elements and look great for years to come. Even in an area of high rainfall, the LP SmartSide 5/50 year-limited warranty provides peace of mind that the siding products used on the home will withstand the elements. Each strand or fiber of the innovative engineered wood siding products are treated with the SmartGuard® process to resist termites and fungal decay. A resin-saturated overlay creates the final layer of protection against the elements, finishing off the material with long-term durability and strength.